The average monthly rent nowadays is almost the same as the monthly amortization should you choose to apply for a home loan. The best thing, you don't waste your money on renting because at the end of the term of your loan you get to finally keep your dream house. And even when we sometimes think that interest rate for home-equity loan or housing loan is quite high. The rent expense will always be higher than any amount of interest paid. 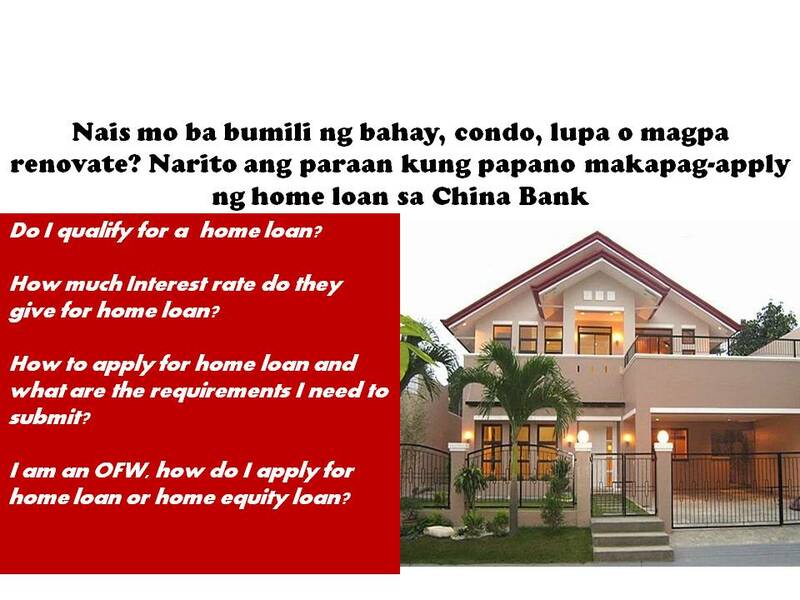 So, why keep renting an apartment when you can purchase your very own house and lot through China Bank (HomePlus) Home Loan. Do I qualify for a home loan? 1. You need to be of legal age. By the time of loan maturity however, you have to be 65 years old. 2. Your source of income should be considered stable, reliable and provable. 3. You should be employed in a managerial or supervisory position with a reputable company for at least a period of 3 years. 4. If you live in Metro Manila or Metro Cebu, your gross monthly income (GMI) should be at least PhP 50,000/month. As for other provincial areas, your GMI should be at least PhP 35,000/month. How to apply for home loan and what are the requirements I need to submit? 2. If married, marriage contract is a must. How much Interest rate do they give for home loan? The interest rate for home loan, always varies depending on how long you intend to pay-off your loan. You might also want to consider that home equity loan or loan with collateral can avail you a much lower interest rate on some banks. Some banks charge lower interest rates on medium and long-term loans compared to short-term loans because the former are secured by collaterals. If you plan to apply for home equity loan or loan with collateral here are other requirements thay you might need to submit. I am an OFW, how do I apply for home loan or home equity loan? Once you have all the requirements, you can submit your documents to any of the China Bank Branches. For other details about this kind of loan, you may call their trunk line: (02) 885 555. You may ask the operator to transfer you to the housing loan department. They are open from Mondays to Fridays, 8:30 am to 5:30 pm. Disclaimer: This is not a paid post, the information gathered here are based on personal experience. We are not endorsing nor are we affiliated to any bank or establishment. We advise loan borrowers to exercise prudence when applying for any loan or mortgage.